Maintaining a warehouse for your e-commerce inventory while running your business at the same time is not an easy task. Managing every detail takes a lot of time and effort. But when you have the right procedures in place, it can make your life a whole lot easier. The following are some tips we have put together to help simplify your warehouse management. The organization of a warehouse affects nearly every other aspect of your business. Do it right, and you will see the results in all your daily operations. Establishing a system of organization that works for your business is essential. We’ve listed a couple of quick tips below, but feel free to check out these 50 expert tips from Camcode for more organization ideas. Keep your fast-moving products in areas that are easy to access. Place products that are typically purchased in bundles close together. Stock similar products like a grocery store would–if you’re looking for milk, you don’t go to the bread aisle. When you get an incoming shipment, make sure that it is verified immediately. The faster you are aware of any damaged items or shortages, the quicker you can resolve any order management issues. It’s also important to put away incoming product promptly. If you don’t, then that stock will show as available in your system, but not on your warehouse shelves. This could send pickers on a wild goose chase when orders come in. Time spent picking items for order fulfillment makes up a significant portion of your operating costs. When you optimize your pick processes, you will save time and money. If your average orders contain numerous different products, arrange lists so pickers go from one product location to the next instead of back and forth across the warehouse. What works for your warehouse organization today may not work a year from now. So, it’s important to reevaluate your storage processes and adjust periodically. Don’t be afraid to make changes. You always want to send the best-quality products to customers, which means your products need to be verified before they are packed and shipped. Packers typically don’t have time to inspect each item before they package it for shipping. So, assign quality control to your pickers, who can inspect items as they pull them from shelves. Or, if your budget allows, have a quality control team that checks products between picking and packing. Making sure your employees are safe is important to your peace of mind and bottom line. Warehouse accidents can cost you skilled labor and lawsuits. One area that seems to always need training and updating is forklift operation. In fact, 20,000 workers are seriously injured in forklift related accidents every year in the U.S. Be sure your forklift operators are well-trained and that they adhere to safety protocols. Check out this list of the top ten common causes of warehouse accidents and start implementing changes to prevent them. Lighting a warehouse is expensive, but worth it. A well-lit warehouse provides a safer environment for employees. It improves energy and productivity, while reducing errors and accidents. This guide will help you choose efficient warehouse lighting. In addition to forklift drivers, it’s important that all of your staff are trained properly. Processes are likely to change from time to time, making it important to have a procedure in place for all staff to stay updated. Cross-training staff members to perform other duties is also a good idea to build efficiency. If one employee is out sick or on vacation, you won’t have an interruption in work flow. There is a ton of software available for dealing with warehouse management. Choosing the right solution for your business is crucial to streamlining your operations. These systems can reduce labor costs, help audit inventory, and improve fulfillment speed. Look for one that integrates with all your other systems for the most optimized operations. Your customers want to receive their purchases quickly. Whatever shipping carriers you use, be sure to offer tracking information to your customers. This helps you provide excellent customer service should a question or problem arise. 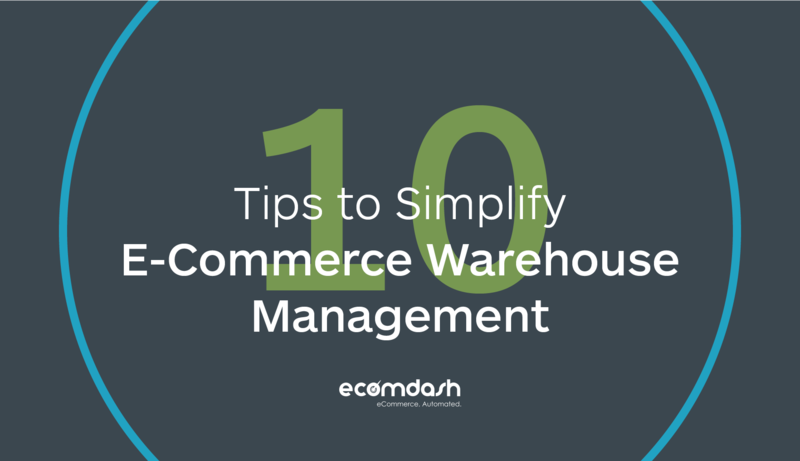 Running a warehouse along with an e-commerce business doesn’t have to be difficult. Keep the above tips in mind to stay organized and safe. This post was written by the team at Ecomdash, an inventory and order management software for online retailers. They focus on providing small to medium-sized businesses with actionable tips and strategies for building a lucrative e-commerce business.